"The XJ-F210WN does an excellent job with data images. Text, spreadsheets, and even architectural drawings are displayed with crisp, well-defined alphanumerics. Small typefaces are still readable even at maximum keystone correction (±30°). The image is sharply focused from corner-to-corner, and there are no visible noise artifacts. The picture shows more dynamic pop when contrast is increased and brightness is reduced. Fine lines are never blurred, and the focus and zoom controls are positive with no overshoot. Video images are clear, sharp, and noise free. Color balance is excellent in the preset modes, but color saturation is a bit low and results in a somewhat flat look for most video images. This may not be a serious issue for classroom and boardroom settings, but the F210WN will probably not be your first choice for dedicated movie viewing. " CASIO projectors are equipped with an SSI* light source employing the mostadvanced light source technology. Although the use of mercury is widely prohibited worldwide today, this hazardous substance continues to be employed as a light source for conventional projector lamps. CASIO has eliminated the use of mercury from its products in consideration of the environment. Adoption of an SSI light source, combined with CASIO's original energy-saving design, also contributes to reducing CO2 emissions. Quick operation provides simple use anytime, anywhere, in an instant. CASIO projectors achieve a startup speed far exceeding that of conventional mercury lamp projectors. Casio also achieve a fast, convenient restart after use because of no need time for both warm-up and cool-down time. Moreover, XJ-F210WN can be switched off by just one touch a button like TV. The XJ-F210WN saves on lamp and filter replacement costs and power consumption. It also has an incredibly affordable purchase price close to that of mercury lamp projectors. The XJ-F210WN provides the best TCO performance in the industry. 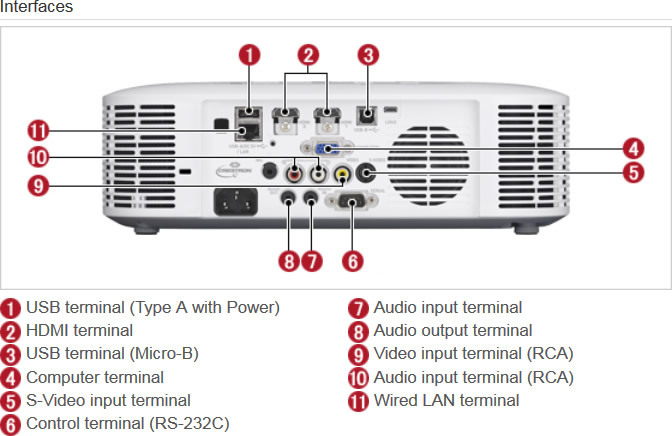 The projector body is equipped with a USB 2.0 host function that enables projection of presentation materials saved in a commercially available USB memory. Not only moving and still images, but also PowerPoint files with animation effects, can be displayed after conversion with free software EZ-converter FA available at CASIO web. [Bundled software] •EZ-Converter FA: Enables users to convert PowerPoint files to a format compatible with this equipment, including animation effects. The XJ-F210WN’s cabinet has a unique structure with three separate blocks, and the primary light source unit is tightly shielded. This suppresses dust intrusion and improves dust resistance, ensuring worry-free performance even in dusty environments.